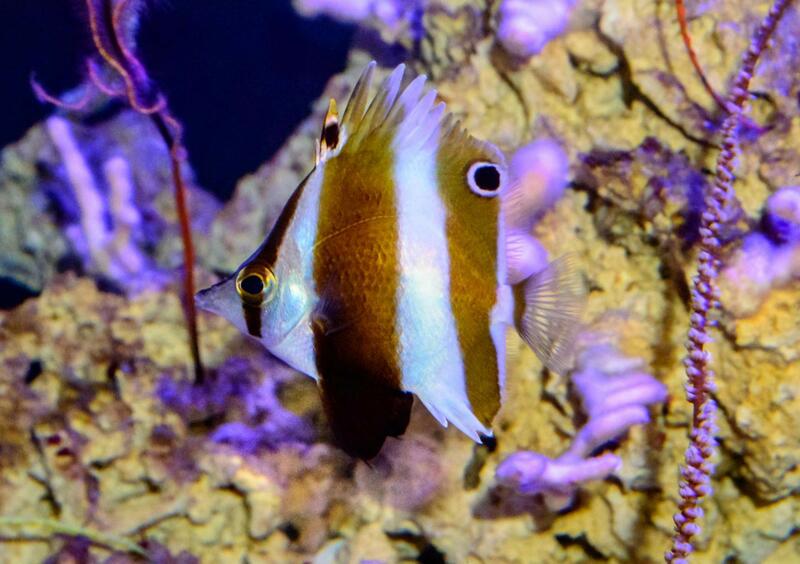 Roa rumsfeldi, new deepwater butterflyfish. Image: LA Rocha. A charismatic new butterflyfish has been discovered and described by a team of biologists from Monterey Bay Aquarium and the California Academy of Sciences exploring the Verde Island Passage in the Philippines, West Pacific Ocean. Roa rumsfeldi, as it has been christened, was found on mesophotic Philippine reefs Oriental Mindoro and Bauan, Batangas, in twilight zone depths of 330 to 425 feet (100-130 m). 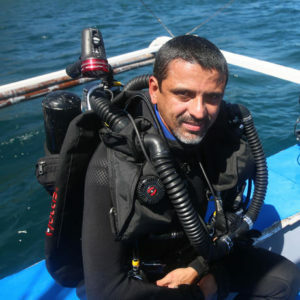 Dr. Luis A. Rocha: looking for life in the twilight zone of deep Philippine reefs. Image: CAS. “This represents the fifth known species of Roa. The main differences between Roa rumsfeldi sp. n. and its congeners are the lower number of pored scales in the lateral line, longer snout, longer caudal peduncle, shorter caudal fin, pelvic fin color (dark first spine vs. white in all other Roa), and genetics (8.4% divergence from its closest relative Roa modesta in the mitochondrial COI gene). Etymology: Name with dark history? The authors choice of a species name has drawn immediate quizzical looks in the aquatics world, and some pointed criticism. Dr. Stephan Tanner, a longtime ichthyology editor and scientific translator (including for CORAL), finds the new name chosen ill-conceived: “While I generally view honoring living people with scientific names as problematic, this one is a spectacularly poor choice! “While Donald Rumsfeld said, “Some things are truly unknown unknowns,” the honoree has done absolutely nothing for science or biology that I am aware of. You could argue that his position in an administration that was hostile to science and facts flies in the face of naming anything after him. “This does not elevate the reputation of the CAS (California Academy of Sciences)!” says Tanner. Others wondered how a politician with a long history giving hawkish military advice to presidents (Nixon, Ford, both Bushes) and as an architect of the still-running Iraq War could be attached to a mild-mannered, pretty little reef fish. Roa rumsfeldi is described in a paper published in the October 18, 2017 issue of the journal ZooKeys.